Yup... I'm hoping it's a short-term hit for a long term investment. If not, I'm gooseberry fool already. I know its early days but it honestly feels like some of the little guys have learnt lessons from last time and are actually playing better football. Squad depth will hopefully start to matter for some of my Academy players to begin to really shine. 1 goal from a forward so far and not one of my starting forwards are in my team any more. Who was Harry Kane again? Just interested .. how many of your current squad were in your starting squad? I only have 3 left hehe. i'm no Aguero fan but did your F stand for five? Made more alterations. Had the worse week since the opening two and I haven't had a settled team since this began. I forgot this thread even existed whoops. But I'm not last? Thank you Vardy! 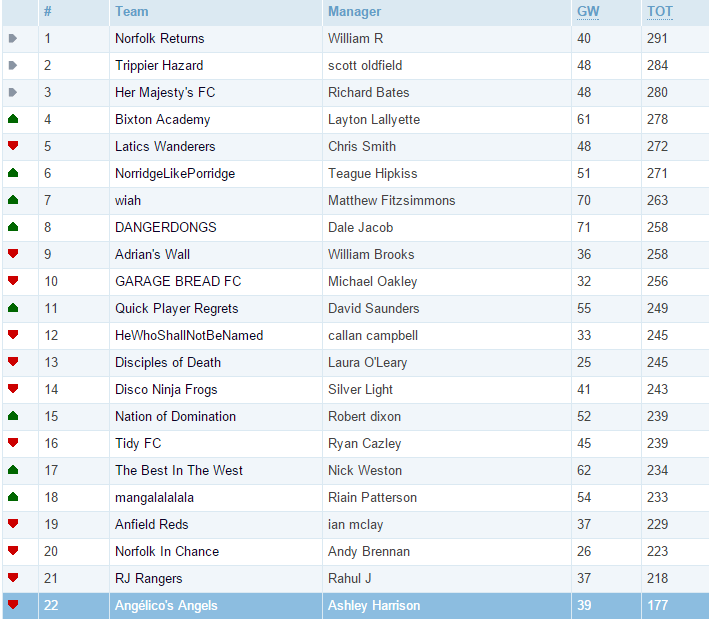 I'm top of my mini league with 641, I guess a few of you guys are pretty good. I'm in 13th somehow? What? gooseberry fool yeah, the comeback is on!